Flood Brothers Disposal presents The Skinny & Houli Show and tonight Houli sounds a little bit like the late Harry Caray, probably the Guinness’ss! The lads start the show with another pitch for their annual trip to Ireland, this year featuring Geno Cooney taking Skinny’s place in the cockpit as we travel across the Emerald Isle October 11-18th. Call our friend Mary Weibler at 800-624-8338 to grab one of the few remaining seats. We welcome our favorite fiddler Katie Grennan, who will be performing Sunday night with Gaelic Storm at Irish Fest! Katie tells us tales of touring across the country with this terrific Irish rock band and then launches into “The Rolling Wave”, kind of appropriate for the night by the river. She’s a darling girl. Lots of laughs along the way with Katie, some Who Cares, and only one obit believe it or not. Then Skinny’s pal John Murray from Arena Partners, drops by to fill us in on all the festivities planned later this month for the 50th Anniversary of Special Olympics. More info at specialolympics50.org. 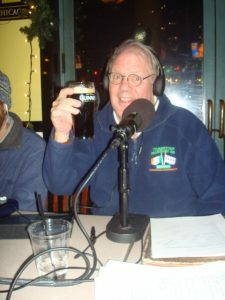 Tune in to this terrific show with Irish music, laughs, and folks doing good in the ‘hood!